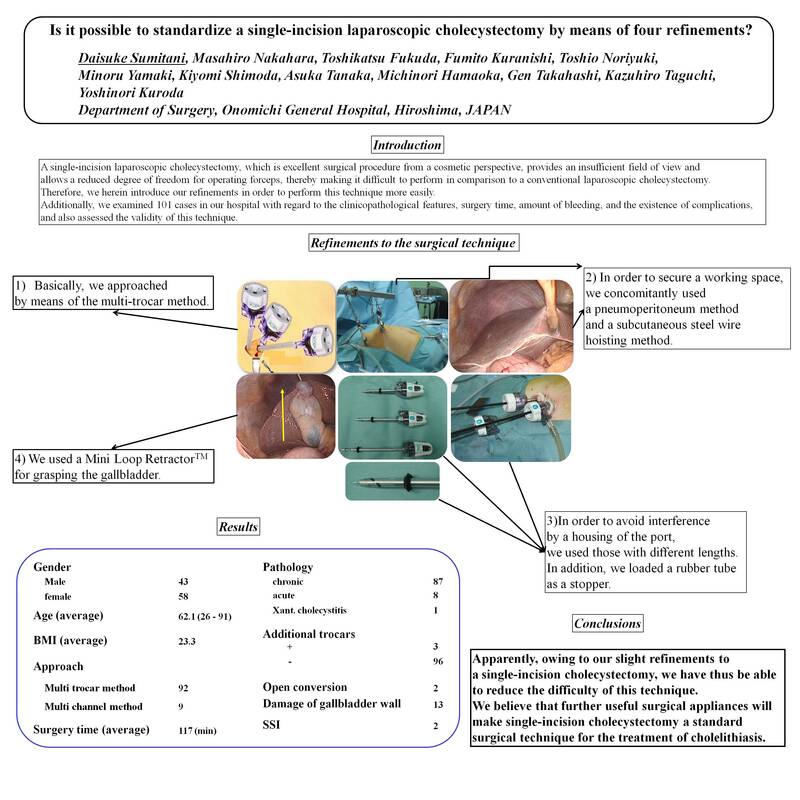 Is It Possible to Standardize a Single-Incision Laparoscopic Cholecystectomy By Means of Four Refinements? [Introduction] A single-incision laparoscopic cholecystectomy, which is excellent surgical procedure from a cosmetic perspective, provides an insufficient field of view and allows a reduced degree of freedom for operating forceps, thereby making it difficult to perform in comparison to a conventional laparoscopic cholecystectomy. Therefore, we herein introduce our refinements in order to perform this technique more easily. Additionally, we examined 95 cases in our hospital with regard to the clinicopathological features, surgery time, amount of bleeding, and the existence of complications, and also assessed the validity of this technique. [Refinements to the surgical technique] 1) Basically, we approached by means of the multi-trocar method. 2) In order to secure a working space, we concomitantly used a pneumoperitoneum method and a subcutaneous steel wire hoisting method. 3) In order to avoid interference by a housing of the port, we used those with different lengths. In addition, we loaded a rubber tube as a stopper. 4) We used a Mini Loop RetractorTM for grasping the gallbladder. [Results] The cases included 95 patients. The average age was 61 years old, including 40 males and 55 females. The average surgery time was 117 minutes, with 23g being the average amount of bleeding. During surgery, 12 cases (13%) presented with damage of the gallbladder wall. Chronic cholecystitis was observed in 87 cases. Postsurgical complications were not observed. [Discussion] Apparently, owing to our slight refinements to a single-incision cholecystectomy, we have thus be able to reduce the difficulty of this technique. We believe that further useful surgical appliances will make single-incision cholecystectomy a standard surgical technique for the treatment of cholelithiasis.